One of our favorite pasta dishes.... and best part, only one pan to clean up! This Spaghetti Puttanesca makes regular appearances in our house. It’s fresh tasting (especially when tomatoes are ripe and in season), savory, and so delicious. The pasta cooks directly in the sauce and absorbs the flavor so nicely. Best part, it’s quick and easy to make, taking less than 30 minutes and requiring only one pan. That means only one pan to cleanup. Recipe adapted from Cooking Light, the sauce is simply garlic, anchovies (don’t be freaked out … they get mashed up and lend a subtle flavor… you could always use less or skip), oregano, crushed pepper, fresh tomatoes, tomato paste and chicken or vegetable stock. 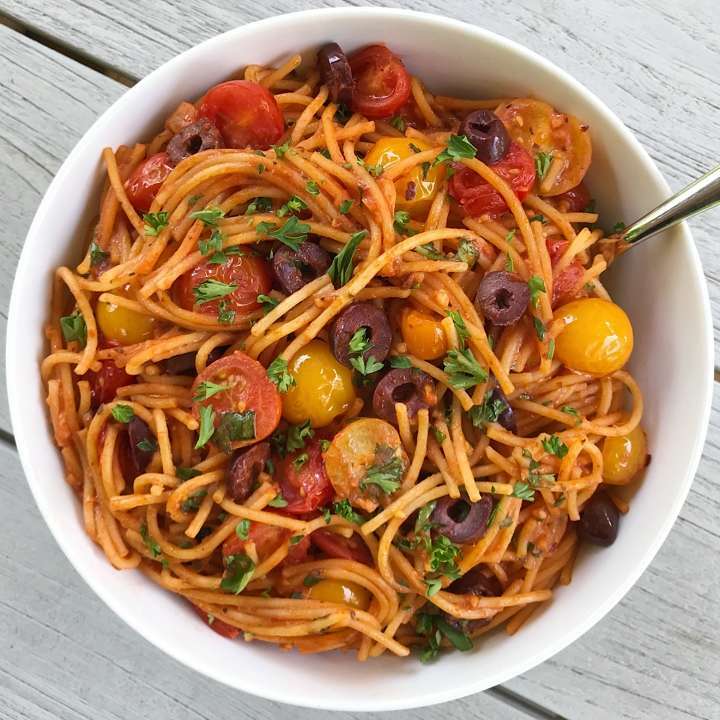 You cook the spaghetti directly in the boiling sauce and then top and mix with kalamata olives, capers (I skip this for my family and still yummy) and fresh basil and parsley. That’s it! Basic ingredients, one pan, and a yummy dinner! 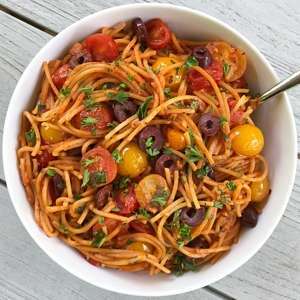 This one pan pasta dish, adapted from Cooking Light, is a fan favorite. It's fresh tasting, cozy and delicious. Best part, it's quick, easy and requires only one pan! Heat a large, deep sauté pan over medium heat. Add oil to pan; swirl to coat. Add garlic, anchovies, oregano, and red pepper; cook 2 minutes, stirring to break up anchovies. Add broth. Bring to a boil. Add spaghetti to pan, lower heat to medium and cook 8 minutes, stirring occasionally especially at first to keep spaghetti from sticking together. Add tomatoes and tomato paste. Cook 2 to 3 minutes or until pasta is done. Remove pan from heat, add remaining ingredients, toss to combine and serve.